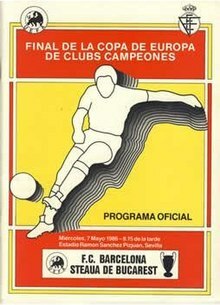 The 1986 European Cup Final was a football match held at the Ramón Sánchez Pizjuán Stadium, Seville, on 7 May 1986 that saw Steaua București of Romania defeat Barcelona of Spain in a penalty shoot out after 120 minutes of play could not separate the two sides. Barcelona had all of their spot-kicks saved by Steaua goalkeeper Helmuth Duckadam, who was later dubbed "The Hero of Seville". It was the first European Cup final to finish goalless and remains Steaua's only European Cup triumph, and the first of only two won by an Eastern European club.